The ultimate level of heating efficiency is achieved through BTU's forced impingement convection technology with side to side gas recircultion. Self-contained blower modules direct heated gas through a perforated plate for optimized convection. Advantages of BTU's patented design include: Unequaled heat transfer and thermal uniformity, Superior zone-to-zone temperature differentials, Unmatched atmosphere control. System provides side to side recirculation convection. Convection is provided via blowers. System utilizes BTU style “Porcupine II” heating elements in a BTU Plenum Module. Each zone incorporates 2 Plenum Module Assemblies which house the heaters, blower mechanisms, and control thermocouples. Each assembly can be easily removed for servicing. 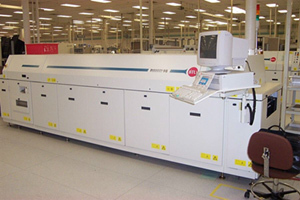 5.Cross belt temperature uniformity is within a 40 C delta T in the reflow zone using standard BTU uniformity test board. Belt deviation detection via programmable deviation alarm. Belt Stopped alarm is standard. Zones are controlled by fourteen ( 14 ) PID control loops of the microprocessor control system. Each zone is divided into top and bottom control. Independent, factory set over temperature devices provide protection of zones 1 through 7 in the event of an over temperature condition. This device is redundant protection in addition to the oven zone temperature controllers. In the event of an over temperature condition, power to the heaters is removed and audible/visual alarms sound. The conveyor continues to operate in this condition. Controls are located on the RIGHT HAND SIDE as viewed from the oven entrance. BTU’s Window’s based WINCON software package provides for full temperature, conveyor speed, monitoring and setpoint, profiling and recipe storage. Computer is located on a swing arm at the entrance onload area of the oven. Temperature control accuracy is + / - .5 degree C. The system includes three thermocouple ports mounted at the oven entrance. These ports connect to the microprocessor so that profiling thermocouples can be connected and used with the Profile software to capture, display, print and store profiles. Automatic shutdown sequencing is standard. Blowers recirculate convection flow in the top and bottom of each heating zone. Four ( 4 ) capped gas sample ports are provided located in zones 1, 7, Cooling and source gas supply. Heated process chamber is capable of maintaining 50 PPM or less oxygen in nitrogen. Cooling section is capable 100 PPM or less oxygen and nitrogen. (depending on source nitrogen purity). (atmosphere system cont’d.) Cooling is accomplished by forced convection utilizing blowers mounted to a water to atmosphere heat exchanger module which is housed in a gas tight stainless steel chamber.